Abi Boja came to Woodhouse from Ashmole Academy and lives in Southgate. 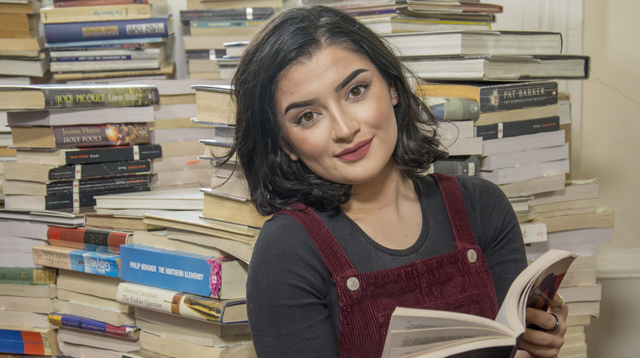 She studied English literature, history and sociology at A level and graduated in 2018 with AAB. She is currently at LSE studying International Relations. “I love literature, the way that it can create a picture in your head… so I wanted to continue to study it at A level. I wanted a place where I’d develop my independent thinking and Woodhouse is the best fit for that. It’s definitely the right place if you enjoy working on your own, but with good support from teachers when you need it. It prepares you for a university environment. A level English literature is definitely a big jump from GCSE. Now we are looking at context and the effects on the reader rather than just the words themselves. It’s more interesting and we look at the history behind the literature too. In class, we’ve done a lot of group activities creating videos clips and documentaries about the work that we’re doing. It’s fun to get involved with the lesson rather than just be lectured. At my old school, I was used to just listening to the teacher talking and taking notes whereas here it’s about engaging with the text. We always get regular emails from our teachers about subject tutorials and resources and they are always sending us different things on Google classroom, we’ve always got plenty of support. And it’s great that I can access practice exam questions on the shared documents very easily from home. We’ve looked at the Gothic and Angela Carter and this year we are looking at Dracula, comparing the two. We also looked at The Tempest and Chaucer’s the Merchants Tale which was quite interesting because I’d studied The Tempest before and knew my way around the text, and I quite like Shakespeare so it was good to re-read it. We’ve had guest speakers come in from Oxford University to talk about Chaucer, which was helpful because that’s quite difficult text, very different English to modern English. It was good to have that involvement from experts. We went on a trip to see Jerusalem – a movie of the play – at a screening in the Victoria and Albert Museum. I really enjoyed that because it’s a beautiful place to go and watch it and interesting to actually see the stage production. We also took another trip to the cinema to see the film version of The Tempest which was very good. I chose the independent film club for an extracurricular activity, I love cinema and I think it links really well with literature. We watched some really cool films including This is England, Wild Tales and Submarine. At Woodhouse, there are always different activities you can do. There was a great media opportunity last year that I got involved with, which was working with Exposure, a youth communications charity that publishes articles in a magazine and online. That went so well that the owner of the magazine asked me to work with them freelance. I work with them regularly now, producing articles and podcasts. They are on the www.exposure.org.uk websites. I’m applying to study a degree in international relations, at Cambridge hopefully. The principal is really involved with our applications, along with many other staff. St Andrews is my second choice, but I also like Manchester. Cambridge has been a dream of mine since I was ten years old. Originally, my parents didn’t speak English, and as they didn’t want me to be at a disadvantage, they would read to me every single night – teaching themselves and me to read English at the same time. Eventually I was quite advanced at school because I had read so much, and that gave me a real passion for books and reading. After university? I’d quite like to work for the United Nations in counter terrorism. But preferably I would like to work in TV and be a news presenter. I love being on camera and working in current affairs, I feel like that’s something that I would be really good at. At my old school, I was a bit complacent because my teachers would effectively do the work for me. But at Woodhouse I realised very quickly that I need to take the initiative myself and put in a lot of effort because the teachers don’t spoon feed you information. You have to enjoy the subject and really want to work for it, and that’s how I got my A grade in the end.